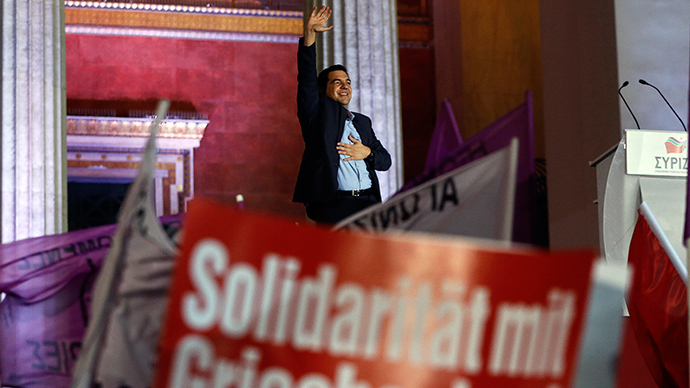 Syriza's Greek election victory has dealt a blow to Eurocrats’ austerity agenda. As the European left celebrated the party's triumph, UK Prime Minister David Cameron warned the result will prompt further “economic uncertainty” in Europe. Cameron made the comment after Syriza beat Greece’s ruling center-right New Democracy party in Sunday's election, paving the way for potential confrontation with international creditors. Throughout its electoral campaign, the left-wing party pledged a series of transformative policies. Syriza leader Alexis Tsipras vowed to renegotiate Greece’s £179 billion bailout, and address clauses that make the Greek government’s implementation of harsh austerity measures mandatory. He also said the party would demand the cancellation of over 50 percent of Greek debt owed predominantly to the ECB and Eurozone states, and place a new debt deal with the EU at the heart of its agenda. As Syriza swept the ruling New Democracy party from power, warnings that incoming Greek PM Tsipras’ party will prompt a euro crisis began to circulate. Reflecting on the anti-austerity party’s electoral triumph, Cameron said the UK must stick to its economic plan of fiscal rectitude. In a climate of increasing economic insecurity in Europe, British policy makers must strive to deliver“security at home,”he warned. Chancellor George Osborne suggested Syriza’s radical demands will require Greece’s exit from the eurozone. In an effort to defend the austerity agenda that underpins his long-term economic plan for Britain, Osborne claimed Greek votes on Sunday weren’t against austerity, but against economic policies that had failed the Mediterranean state. Speaking on BBC Radio 4’s Today program, the chancellor echoed Cameron’s stance that the election result would increase economic uncertainty in Europe. #Greece's elections are a cry for help from those who have been impoverished by the Euro. Game of poker begins with Merkel. ECB powerless. But Euroskeptic UK Independence Party (UKIP) leader, Nigel Farage, disagreed. “Greece’s elections are a cry for help from those who have been impoverished by the euro,” he said. Farage argued Syriza’s victory marked the beginning of a “game of poker” with German Chancellor and EU austerity architect Angela Merkel. He also suggested the ECB will be “powerless” as this political game unfolds. Shadow Welsh Secretary Peter Hain said austerity hasn’t worked for Greece, for Britain or for the wider EU. 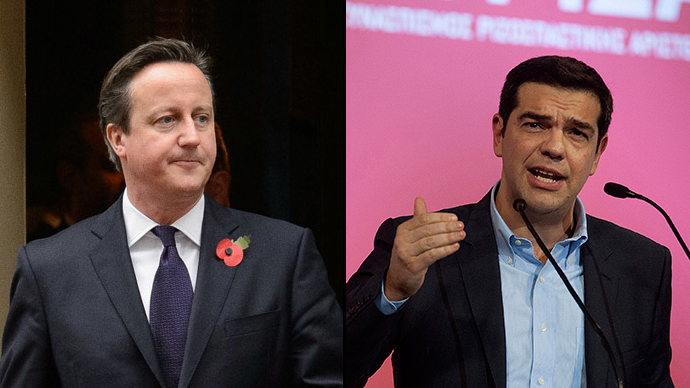 Lauding Syriza’s victory as “fantastic,” he argued investment in growth must replace savage cuts in Britain and Europe. Left-wing comedian and political activist Russell Brand also weighed in, calling for a new party in Britain that could emulate Syriza’s radical position. Brand said he would abandon his propensity not to vote if a similar party emerged on Britain’s political horizon. Despite concern amid Eurocrats and financial institutions that a Syriza victory could spell disaster for the eurozone and the euro itself, European stocks have remained relatively stable since Sunday. Analysts suggest recent European Central Bank stimulus measures pursued by the bank’s chief Mario Draghi have neutralized fears over the anti-austerity party’s victory. But Yanis Varoufakis, Greece's incoming Finance Minister and a leading economics professor, contested this view. “The people of Greece gave a vote of confidence to hope,” he said. While it remains unclear whether Greece will leave the euro, how Syriza’s policies will affect the single market currency and what they will mean for Britain and eurozone member states in the long term, one thing is certain: Syriza have proved it’s possible to build a successful political movement that can challenge austerity, and the governments and international creditors that propel it. Syriza leader Alexis Tsipras will be officially sworn in on Monday afternoon as Greece’s new prime minister. As his party begins its task of restructuring Greece’s political and economic position on a fraught European stage, leftist parties in Britain and Europe will be watching closely.